Greyhounds may be one of the most ancient of dog breeds—but learning how to take care of them can still be quite a challenge! 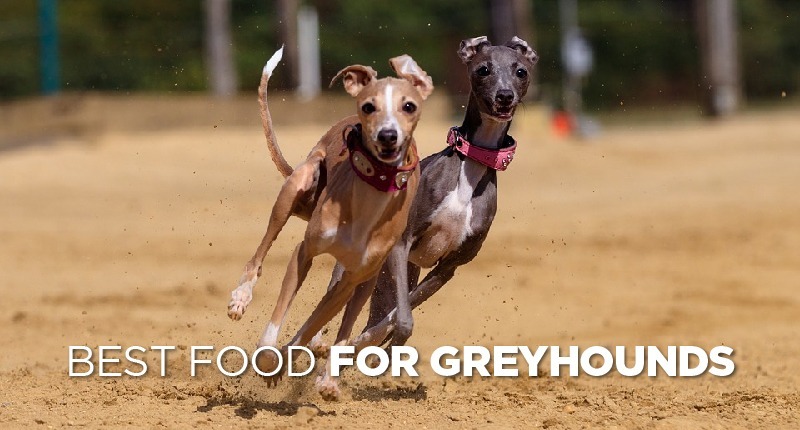 Finding the best dog food for Greyhounds, however, is a great first step—and in this article, we’re going to help you do exactly that! **Below, you'll find our expert's recommendation for greyhounds, but we also recommend the foods above; you can click the links above to see current prices or read customer reviews from dog owners on Chewy. Greyhounds are an iconic dog breed that seems to have been built with speed and agility in mind. They’re a very old and well-known breed, and probably found their beginnings in ancient Egypt. 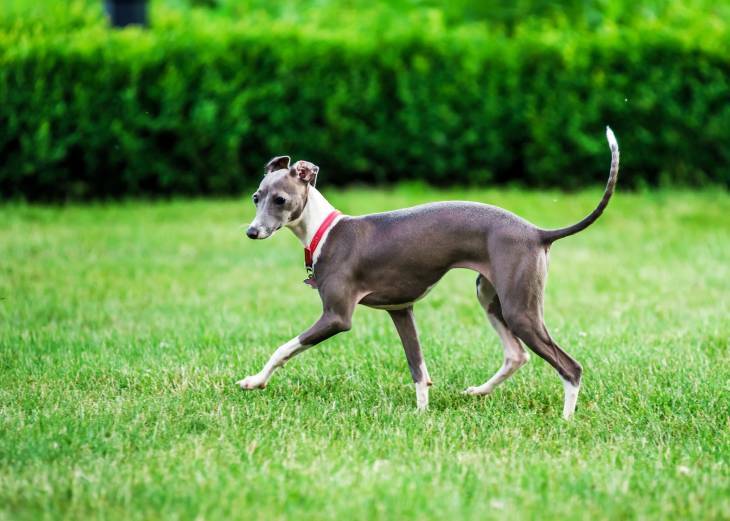 Many prolific figures throughout history have prized this aerodynamic canine, including Queen Elizabeth the First of England, George Washington, and Cleopatra. Greyhounds tend to be friendly toward people and other dogs (if properly socialized over the course of their lifetime), and make loyal, affectionate pets. Surprisingly, they do a lot of sleeping—though they also enjoy walking and running as activities. For a larger dog breed, they tend to do fine in a variety of different living situations—including apartments. They do need to be kept inside a fence or on a leash while outdoors, however—as their ‘prey’ mentality might get the better of them if they see a squirrel or a rabbit dashing down the street. Greyhounds generally grow to stand between 2 and 2.5 feet in height (at the shoulder), live 12 to 15 years, and will weigh in at somewhere between 50 and 85 pounds. A less-active Greyhound will need somewhere around 1400 calories per day to keep their energy up, whereas a moderately-active dog will need a daily caloric intake that’s closer to 1700. For a dog of this breed that tends to be very active, you’ll need to raise the daily caloric intake to somewhere between 1900 and 3500. The exact amount, of course, will depend on the dog. You should try not to overfeed, but you also want to make sure that your hound is getting the calories that he or she needs to match his or her activity level. The more active the dog is, the more calories he or she will need to get through the day. This video, put together by Animal Planet, will give you a ton of information about the Greyhound, where it came from, and whether or not it might be a suitable pet for you. While Greyhounds do tend to live long, healthy lives, they can be prone to a few different health issues. Here are some of the more common ailments that the breed tends to deal with. Bloat, also known as ‘Gastric Torsion’, happens when air gets trapped in the dog’s stomach. It gets stuck when the stomach itself distends and twists. If not treated quickly and properly, the condition can be fatal. To help prevent bloat in Greyhounds, try to avoid exercising your dog right after meals. You should also avoid feeding your pet a diet rich in corn, wheat, soy, rice, or oatmeal. Allowing your dog to drink a large amount of water right after eating is also a bad idea. For more specific information about this condition, visit this page on healhypets.mercola.com. This condition occurs when the thyroid doesn’t work like it should. One side-effect of this disease is infertility, but obesity, lethargy, mental dullness, irregular heat cycles, and droopy eyelids could all be indicators. After a while, the dog’s hair might also begin to fall out if he or she is suffering from it. For a more detailed description of the disease, you can visit this page. According to this article, most dogs with Hypothyroidism don’t get adequate nutrients or minerals in their diet. So feeding your Greyhound a nutritionally sound diet full of vital nutrients could potentially help you to avoid this problem altogether. Greyhounds are actually more sensitive to anesthesia than other dogs of the same size. To help avoid problems with this, make sure to choose a vet who is aware of this breed-specific detail. Choosing a vet who regularly works with Greyhounds is probably the best idea, if at all possible. It’s not uncommon for Greyhounds to give birth to litters of up to a dozen—which is definitely a big responsibility! The mother tends to start the weaning process at somewhere around 3.5 weeks, which is when the breeder will become solely responsible for feeding the pups. You can read an excellent article about what it takes to care for a litter of Greyhound pups here. Interestingly, these puppies are seldom available for adoption—mostly because they’re so valuable as potential racing dogs. Puppies of this breed will typically weigh in at around 5 pounds at 9 weeks of age—which means that they’ll need about 380 calories to stay energized if they’re moderately active. Of course, since Greyhounds tend to grow so fast, it might be necessary to increase their caloric intake slightly week-to-week. As a general rule, dogs of this breed will be ready to transition to adult dog food when they’ve reached approximately 90% of their adult height and weight (which will take anywhere from 12 to 18 months, depending on the animal). Whether you’re getting your Greyhound as a puppy or adopting a retired racing dog, you definitely don’t want to feed your new pet ‘cheap’ grocery-store dog food. Your Greyhound needs well-rounded nutrition, plenty of protein, and wholesome, natural ingredients. We’ve scoured the internet looking for the very best choice of foods for Greyhounds, and were pretty excited when we found TimberWolf Wild & Natural Platinum Formula. We give this dog food brand two thumbs up, and enthusiastically recommend it for a number of different reasons. First of all, this dog food offers a diet that’s high in meat, leafy greens, animal protein, fruits, vegetables, probiotics, and micronutrients. It’s developed to properly nourish your dog, and was formulated for canines in all stages of life. This food is often a first-choice for military and police-force canines, though it’s also popular with working dogs of many different calibers. It’s a perfect choice for Greyhounds because it contains the nutrients required for positive health and development at all ages—even for dogs who are debilitated or retired. This animal-meat based formulation packs in over 10 pounds of fish and chicken for every 20 pounds of dog food. It also contains ingredients like herring, salmon, and spray dried chicken liver. If you’re looking for a dog food that’ll serve your dog well, even in later years—then our opinion is that you can’t go wrong with this one. 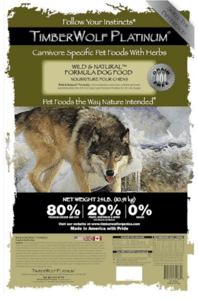 There are definitely a lot of quality dog foods on the market today, but TimberWolf Wild & Natural Platinum Formula seems to go above-and-beyond in all of the areas that matter the most. Here are the basic pros and cons that we discovered about this dog food choice over the course of our research. If you’re looking for a meat-based, grain-free dog food that’ll give your Greyhound a better chance at a long, happy, and healthy life, then you’re going to be hard-pressed to find something better than TimberWolf Wild & Natural Platinum Formula. Of all of the many high-quality foods on the market today, we definitely feel that this one should be at the top of your shopping list.